alongCapeCod: Cape & Islands - Local Music Scene! Cape & Islands - Local Music Scene! Cape Cod has a most enviable talent pool of musicians, including (but by no means limited to) high school bands, town bands, rock bands,choral groups, big band swing, a professional symphony orchestra and even an American Idol finalist! Rock, jazz, blues, bluegrass, classical, country, folk are just some of the genres that can be heard year round... Join us as we listen to and support our local Cape Cod musicians. Cape Cod's own Cape Cod Symphony Orchestra under the direction of Artistic Director and Conductor Jung-Ho Pak, takes the stage at Salt Pond Visitor Center's Outdoor Amphitheater in Eastham. Mark your calendar for the 3rd Annual Symphony at the Seashore concert on Friday, August 24, 2018! This free outdoor concert, presented by the National Park Service and Cape Symphony, includes musicians and singers from the United States Air Force Band. Selections will "... highlight Hollywood blockbusters featuring National Park locations (think John Williams! ), and celebrate our nation with heart-stirring patriotic songs." Looking ahead to the fall, "Inspiring Joy" is the theme for the symphony's recently announced 2018/19 concert series. Performances sell out, so be sure to order tickets in advance! The Chatham Chorale & Chatham Chorale Chamber Singers, now heading into their 48th season, have presented hundreds of choral music programs in various venues on and off Cape Cod to inter-generational audiences. The group is currently directed by Joe Marchio, who is also a music professor and choral director at Cape Cod Community College, as well as conductor of Cantata 4 Ensemble, a vocal/instrumental group of professionals and students that specializes in Baroque music performance. The Chatham Chorale performs several concerts through the year. Stage Door Canteen, Cape Cod's own world traveled big band, performs monthly at Liam Maguire's in Falmouth. Dancing shoes are strongly suggested, as it is hard not to get up and dance to this highly versatile band as they play a variety of big band, swing, jazz and even Mowtown hits. 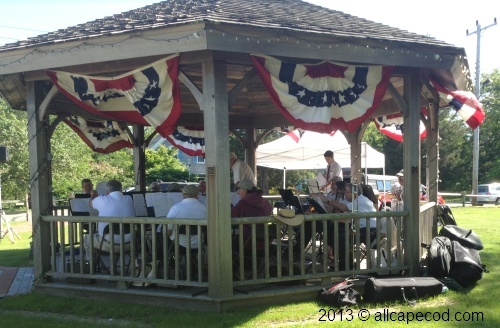 Several Cape Cod towns host weekly summer band concerts - offering an evening of music that includes Broadway tunes, jazz, big band, classical, pop, marching band tunes and more from Town Bands and other invited performers. Most, if not all, are outdoors in parks, schools or waterfront settings, and are open to the general public. Pack a picnic basket, toss some folding chairs or a blanket in the car, and join your family and friends for an evening of toe-tapping fun at any of these family friendly free! summer concerts. Cape Cod & Martha’s Vineyard are home to 3 'a cappella' groups, comprised of talented college students from all over the nation who come together to sing from June through mid August (while enjoying the Cape Cod summer...). Cape Harmony is Cape Cod's premiere all-female a cappella group; hear them weekly Tuesdays, Wednesdays, Thursdays and Fridays. The Hyannis Sound, Cape Cod’s all male group since 1994, have weekly gigs on Mondays, Tuesdays, Thursdays and Fridays. Last, but certainly not least, Vineyard Sound, an all male college group now in its 26th season, performs weekly shows around Martha's Vineyard on Mondays, Tuesdays, Thursdays and Fridays. These a cappella groups perform primarily indoors at churches, but do perform at some outdoor venues. In addition to regularly scheduled weekly performances, there are many special appearances. Visit their websites for complete performance schedules. Take a stroll along Main Streets during July & August - shop, eat, people watch and enjoy the sounds of summer... Monday Night Music Strolls in Chatham, from 6 to 9PM, feature local bands, musicians and others performing between the rotary and the Chatham Wine Bar. Please support the businesses that host and sponsor this great entertainment. Wednesdays are Port Summer Nights in Harwich Port, presented by the Cape Cod 5, and sponsored by Harwich Chamber of Commerce Events Committee and several local businesses. Summer Thursdays are "Cool Jazz Nights" on Main Street, Hyannis, sponsored by The Hyannis Main Street Business Improvement District. Stroll along Main Street and listen to the Alan Clinger Jazz Trio from 7:00 to 9:00 PM every Thursday from July through mid August outside at a different Main Street busisness each week. 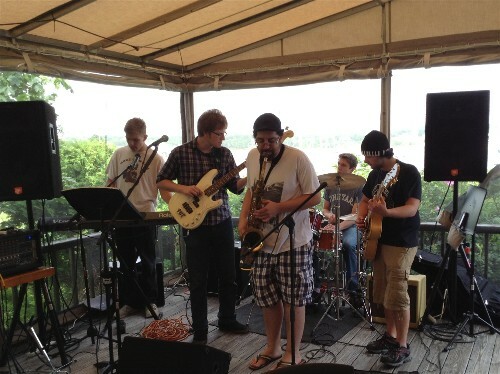 The Pearl at Wellfleet Harbor is host to family friendly "Fresh Music Live Seafood Happy Hours" with LIVE local musicians every day of the week from 3:00 to 5:00 PM. Well known singers and bands include Bruce Maclean, Super Soulshine, The Johns, The Rip It Ups, Grab Brothers, Brian Sances & Nick Suchecki, and the Aaron Norcross Trio. Want to show your talent? Sing out loud! Several venues offer open mic nights and weekly Karaoke. Music Bingo has made it's way to Cape Cod. See our calendar times & locations. Prefer the beat of a different drummer? Check out Cape Cod African Dance & Drum for summer performances and workshops. Join the dancers or just sit, watch, and enjoy the rhythm of the live drummers. Thanks to our local talent and sponsors like Cape Cod Five, Citizens Bank, TD Bank, our local businesses, recreation departments and chambers of commerce, there is live music almost every night of the week during the summer months! Please support the businesses and establishments that feature and promote local musicians.